In a world where it seems anyone and everyone is a musician, its hard to filter the class from the shite amidst all the over-saturation. Every Tuesday, TheRootMusic is bringing you some of the best up-and-coming musicians. As always TheRootMusic will focus upon hip-hop and grime but will occasionally venture into other genres for musicians of a particular pedigree. 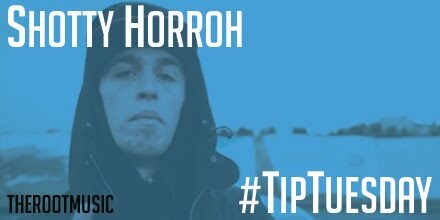 This week we bring to you Shotty Horroh. Many will know Manchester’s Shotty Horroh for his battle rap legacy. Widely regarded as one of the best, and undoubtedly the biggest battle rapper to emerge from the UK, Shotty found success in America and Canada during his career. He’s since retired from battling in order to focus on music, and in turn 2017 proved to be the battle rap legend’s biggest year in music to date. In July, Shotty signed a deal with DeadMau5’ Mau5trap imprint. As a hip-hop artist it seemed like an unusual move to work with an EDM superstar but it undeniably put a lot more eyes on Shotty – and from a different demographic. Although nothing officially has been put out there, it does appear Shotty has moved on from the Mau5trap family having signed a four year deal with Sony. The Sony deal is no surprise considering Shotty’s buzz and international respect for his battle rap career. Now labels don’t do much artist development, they’re looking for artist’s who already have fan bases and Shotty’s has one of the largest followings in battle rap – there’s no reason that can’t translate to music too. While not all of the Manchester musicians music has been to my personal taste, there’s absolutely some gems been released over the years. With Sony’s backing, Shotty just needs one hit to open the doors and then he could be out of here. I’d love to see Shotty’s music hit so well we no longer refer to him first and foremost as a battle rapper. He’s not leaving the battle world behind either, though. With the fall of Don’t Flop, Premier Battles has emerged as one of the most exciting UK’s leagues and largely because of its unique team-based concept. So even if Shotty’s music career doesn’t go according to plan, which isn’t looking likely, he’s always going to have a home in battle rap. Maybe’s we’ll finally see Shotty Horroh vs Lunar C? Posted in UncategorizedTagged Shotty HorrohBookmark the permalink.